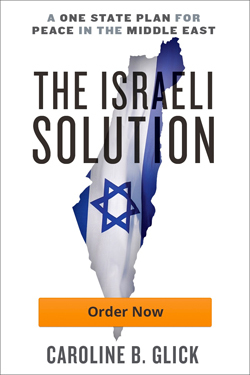 Caroline Glick has written a provocative new book entitled The Israeli Solution: A One State Plan for Peace in the Middle East. In it, she argues that the futile quest for a two-state solution to the Israeli-Arab conflict over the land between the Mediterranean Sea and the Jordan River is misguided, ill-conceived and doomed to failure. As have many before her, she points out that the “two states for two peoples” mantra, which is promoted so mindlessly by clueless diplomats, statesmen and pundits, and whose outline is broadly ‘known’ to all who envision it, would result in a death sentence for the Jewish State. Those who favor the two-state solution are often untroubled by that prospect. Or they deny, in unconvincing fashion, that such an outcome is likely. Moreover, “friends” of Israel bemoan the fact that there is no other choice: If the two-state solution is not implemented, then Israel either loses its Jewish character or its democratic nature. This is inevitable – just ask that great friend of Israel, John Kerry. Balderdash, replies Glick. She argues that the demographic time bomb that is supposedly ticking louder and louder is a myth.